This instrument is so unique it just has to have it's own Sound Travels category! 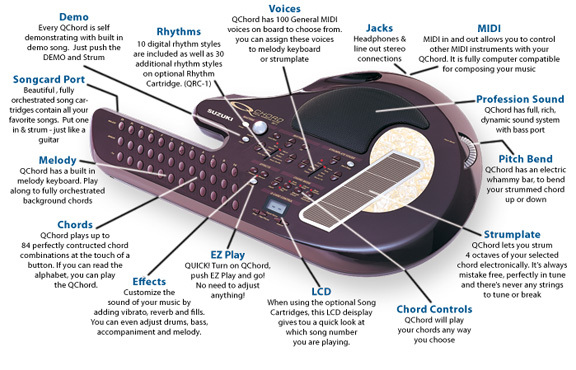 The Q Chord (new generation Omnichord) is both unique and innovative, taking creative enjoyment to a level unattainable on more conventional instruments. Essentially a mass-market product, anyone can play the instrument, the first time they try... whatever their level of playing skill! Some of the main reasons why the Q Chord is so successful:It's Easy To Play:From "zero" to "musician" in 9 seconds flat! Just press a chord button, strum the "strings" on the unique "strumplate". Always in tune, you'll sound great using just the basic features, without ever making a mistake. The Q Chord incorporates the best technology from a basic keyboard and electric guitar and combines both in a portable, easy to use way. The instrument is divided up into three sections; a touch sensitive 'strum plate', a rhythm section and chord button section. Each of these areas can be used independently or combined. There are many wonderful and varied sounds obtainable from the strum plate and the combination of different musical sounds achievable is both impressive and unusual! The Q Chord is quite simply a unique instrument that anyone can play, from novice to accomplished musician. By using the basic features, the player will always sound 'in tune' and the 'strum plate' has been designed to avoid any 'wrong notes'! From a complete beginners point of view, a degree of enjoyment is normally only achieved after several months hard work in learning to play more conventional instruments. This is why so many keyboards and guitars end up under the bed, or stored away, never to be seen again! The Q Chord takes the drudgery out of repetitive practice and allows instant creative musical enjoyment! Because the Q Chord takes the hard work out of playing, it makes the art of making music more fun and therefore allows more creativity with regard to composing music. As a composition tool therefore, the Q Chord is unmatched with regard to its versatility and portability. There are many famous artists who use the Q Chord (or old Omnichord) such as Jarvis Cocker, Robbie Williams, David Bowie, Elvis Costello, Brian Eno, Bob Dylan, Ringo Starr and Bjork to name but a few! The pop group 'The High Fidelity' has used the 'quirky' sounds of the Q Chord to good effect and plays the instrument a lot in their recordings. They also share their enthusiasm for the instrument with Radio Ones John Peel. When Sean Dickson (The High Fidelity) was asked on Radio One "What's it like to play, is it easy?" Sean said "Oh, it's very easy, anyone can come up with something in about half an hour. It's not like any other instrument". Brian Eno maintains "I couldn't do without it!" Anyone can create great sounds from the Q Chord, which in itself is an inspiration to use it more and more. This somewhat addictive aspect to the instrument can motivate the novice to learn more about the music they are creating. Multiple skill levels on the Q Chord will allow natural progression in this way. Many schools have now adopted the Q Chord as an accompaniment instrument for classroom sessions or for individual student tuition. There are a number of accessories available for the Q Chord, the most notable of which are the song cartridges. These plug into the instrument and the karaoke effect makes it possible to play as well as sing along to pop favourites, country and western, religious, children's favourites, party hits etc. Great fun for all the family to join in! The Q Chord is easily connected to a speaker, for increasing volume to larger audiences, if required. The MIDI facilities also allow connection to other instruments or to a computer if needed. Not everyone wants to be a world class musician, but many people would like to play an instrument well enough to enjoy what they are playing and hope that others are enjoying what they are listening to! The Q Chord does both! • Any age - anyone from very young to very mature! • Anyone can play - whatever his or her level of playing skill. • Composition -the ideal composing instrument. • Teaching - an excellent educational instrument. • Therapy - now used in specialist Therapy Centres. • Reduce stress - great for reducing stress levels for everyone! • Suitable for many outlets/groups -Churches, Playgroups, retirement centres etc. • Ideal for all the family to use. • A good alternative (to guitar or keyboard) for the club performer!